Image 1. View from Albert Dock towards Mann Island. The small red brick building in the middle is the Pilotage building. Photo: Wikimedia commons. I worked as a Mobius fellow at the Merseyside Maritime Museum in September – mid December 2015. In this analysis I will introduce the museum and its organisation and give an overview on the tasks I did performed during the fellowship. I will also highlight some on-going trends that I paid attention to at the NML (National Museums Liverpool), as they are threads I am interested in developing in my home institution. I will also focus on the impact the city’s past maritime trade reflects on Liverpool museums’ collections today. Particular attention has been paid to the Maritime Museum’s efforts in publishing content on their website. Nowadays, not only the physical visitor numbers, but also the electric visits to the websites, are used to measure the affect the museums have on the communities. I decided to apply for Mobius fellowship because, in my opinion, gaining experience and knowledge from other people and institutions is essential for one’s professional development. I had been in the same post at the Maritime Museum of Finland for ten years and I felt that I could increase my own motivation as well as gain perspective into my own work by visiting another, somewhat similar institution. I believe that it is vital also professionally to leave one's comfort zone and step away from the familiar working environment and just see what happens. I decided to apply for a fellowship in Merseyside Maritime Museum because I did my PhD in Liverpool and continued to live and work there until 2005. Professionally speaking, I knew the maritime museum was brilliant there, as one of my previous supervisors was employed by them. I did my PhD on maritime history and worked several years at the University of Liverpool on a project researching Liverpool’s ship owners and merchant culture in the Victorian era. Therefore I felt that I might be able to provide something back as I know quite a bit on the substance and scope of the content they produce, as well as their archives, exhibitions and events. Due to my previous work experience and living in Liverpool for seven years, I am also familiar with the history of the city. The museum is situated in the Albert Dock in the Liverpool city centre, together with other visitor attractions such as the Tate North and the Beatles Story. The maritime museum building is in the middle of the old dock area in a warehouse originating from 1846, the year when the Albert Dock was officially opened. 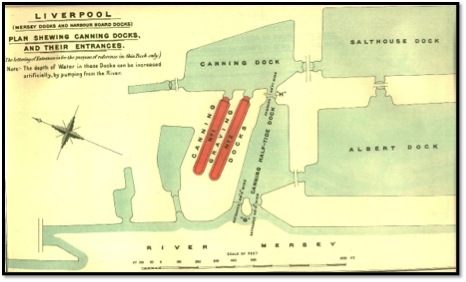 At the time, the Albert Dock was considered a revolutionary docking system because ships were loaded and unloaded directly from/to the warehouses. Image 2. Albert Dock and other surrounding docks in 1909. Photo: British Admiralty (Public Domain). The warehouses were in a huge fire risk at that time and therefore the Albert Dock’s warehouses were built, as the first structure in Britain, entirely of cast iron, brick and stone. In 1899 the building was converted for a cold store and ice-making plant. However, due to technological changes in shipping (such as the increasing size of ships) the Albert Dock soon lost its importance as a dock, and later on the managing company, the Mersey Docks and Harbour Board, went bankrupt. As a consequence, the area was completely derelict for decades but thanks to a major regeneration program the Albert Dock was reopened in 1988.The maritime museum is a vital component in the concept that relies heavily on the Liverpool’s maritime past and its position as the second city of the empire. Image 3. 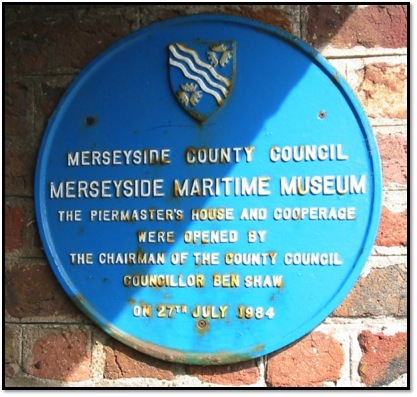 The plaque attached to the museum's wall marking the opening of the piermaster’s house and cooperage by the maritime museum building. Photo: Wikimedia Commons. The Albert Dock area, with its museums, restaurants and other activities, is the most visited free attraction in the South-West. The Maritime Museum alone attracts approximately 700 000 visitors a year. Liverpool gained a lot of funding and investors around 2008, when it became the UK cultural capital. A new complex, Liverpool One, was also then built near the Docks, which shifted the balance to the right direction from the museum’s point of view, and the visitor numbers have increased massively since. In the late 2015, the maritime museum had six ongoing exhibitions within its premises. Their exhibition content is focused on passenger travel as there is Lusitania exhibition, due to the centenary of the disaster in which 1198 people were killed when the vessel was torpedoed by a German submarine in 7th of May 1915. There was also an exhibition on Titanic and its connections with Liverpool as well as “Sail Away: Liverpool Shipping Posters” display. The history of Liverpool is closely connected to those famous vessels as the shipping companies’ headquarters were in Liverpool and most of the crew working on the ships called the city their home. Furthermore, due to Cunard Company’s 175th anniversary, there were two displays at the museum to celebrate the event. Image 4. 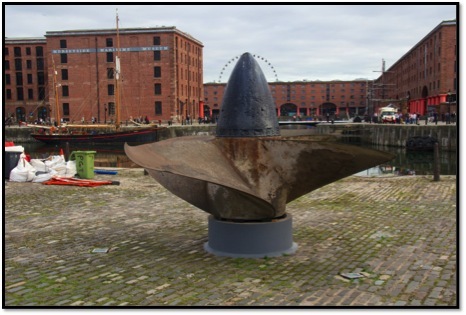 HMS Lusitania's propeller at Albert Dock. Photo: Wikimedia Commons. The Maritime Museum is part of the National Museums Liverpool (NML), which consists of five museums and three art galleries. In NML’s organisational structure, museums and galleries are part of the Collections and Estate directorate. Collections management, Estate management and Exhibitions department are also housed as part of this directorate. The deputy head of the Maritime Museum is also curator of maritime history. In addition, Maritime Museum employs 12 people, seven of which are curators or assistant curators. This number includes the Maritime Archives and Library (MAL) staff. The deputy head manages three curators and one assisting curator. The director of the museum leads, apart from the maritime museum, also other “waterfront museums”, namely the Museum of Liverpool, the Border Force's national museum and the International Slavery Museum. In its recently published annual review for 2014/5, the NML claims to be a unique organisation as being the only National museum consortium in the UK outside London. They receive 2,7 million visitors per year and in addition 2 million visitors to their website and 100 000 engagements through social media. An amazing 32 per cent of their income was self-generated, which in my perspective, is a good figure. The NML, including the maritime museum, is experimenting in using art and artists to look, interpret and display their collections, which is something I would like to see more in Finnish museums, too. As the museum is situated in the old docks, and it being a maritime museum, there are many ships around. One of them is a museum ship and old pilot cutter Edmund Gardner, a ship run by volunteers. Together with the Tate Gallery the ship ran an art project as part of the Liverpool Biennale. The artist Carlos Cruz-Diez painted the ship and one of the Mersey ferries in bright colours in spirit of dazzle painting. It was used by the Brits in the First World War for camouflaging the vessels, many of which were merchant ships in normal circumstances. The same ship has been used as an object in light artists’ displays by illuminating it in dark nights. Image 5. Detail of Edmund Gardner painted in dazzle. Photo: National Museums Liverpool. Another exhibition involving artists and volunteers is the Museum of Liverpool’s It’s Glam Up North. It is curated by a famous UK photographer Ian Rankin, who also exhibits his own work. Some of the most well-known names in design, art and filmmaking are on display there. As NML includes art museums as well, I went to see quite a few art exhibitions curated by the NML staff. The art museums’ collections are impressive, including works by Rembrandt, Turner, Rossetti, Monet and Hockney, to name a few. In addition, they hold one of the best pre-Rafaelite art collections in the world. The Reality exhibition by such modern and contemporary British painters as Walter Sickert, Francis Bacon, Lucian Freud and LS Lowry was also curated by an artist, Chris Stevens. My idea was to adopt a somewhat broader approach to the city’s maritime history collections during my fellowship. I started thinking of the many ways the city’s maritime past, and especially maritime trade, reflects in the heritage organisations’ collections. Liverpool’s history as the gateway to the Empire and as a major port affected its position as one of the key centres for the slave trade. The NML’s International Slavery Centre holds exhibitions at the maritime museum and is the process of developing its own collections. Liverpool’s maritime past is present also in other NML’s museums such as in the Lady Lever Art Gallery and the World Museum. The Liverpool millionaires and rich merchants would put togehter an art and botanical collection during the city's hayday in the 19th century. Sudley House, for example, was donated to the City Council by Emma Holt, a member of the Holt family who were prominent local entrepreneurs and ship owners. Sudley House is the only location in the UK presenting Victorian art in its original surroundings. In addition, some of acquisitions are a direct result of the colonial trading actions between Liverpool and other continents. I had a meeting with the curator of NML’s botanic collections Donna Young to find out how the city’s maritime past has affected the botanic collections. She told me that some crew members in the past would collect plants in foreign ports and donate their extraordinary collections to museums. The Maritime museum has its own collection of almost 300 oil paintings. They have opened most of their paintings with metadata on the BBC’s national website. NML is producing an increasing amount of content into its websites. The Museum of Liverpool has developed an interactive map in its recently constructed museum building, which is the largest newly-built national museum in the UK for over a hundred years. The map has moving image and other visual information in it, as well as old maps and sound. The website connected to the Lusitania exhibition also includes mapping information and an information gathering project for audience's memories of the people who were on Lusitania while it sank. The homes of the vessel’s crew are being placed on a map of Liverpool. By enlarging the image you can find details of the crew’s address and other possible information related to them. Image 6. An example how information is mapped. 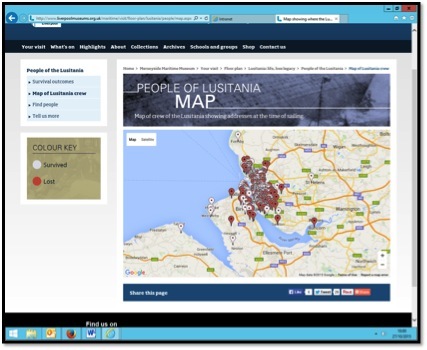 Screenshot of the People of Lusitania website. 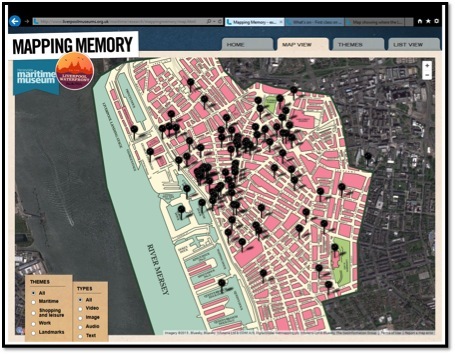 Even more information is attached to another interactive project, named Mapping Memory. It contains photographs, videos and interviews of those who lived and worked by the Liverpool waterfront from the 1950s to the 1970s. Information has been organizd around maps as well as by thematically. You can find out about the history of Liverpool through different themes of your choice, either Maritime, Work, Shopping and Leisure or Landmarks. Image 7. Mapping memory-project by the Merseyside Maritime Museum. A screenshot from their website. One of my first actual tasks as a Mobius fellow was to go through a vast number of response from the audience who visited the ongoing Lusitania exhibition. The museum team had created a website where all the crew and passengers who were on board the night it sunk were listed, with some biographical information. However, the museum is gathering more information by an interface at the museum as well as on their website. The staff was surprised by the response as they received hundreds of very well informed messages on the subject. I basically edited the emails and organised the information into spread sheets for the expert to decide what information was taken on board, and which respondents required further contact. I see this information gathering project as a well-organised crowdsourcing. The topic is suitable for this type of knowledge-gathering and has a strong local interest, the number of records that need enhancing are manageable, and people who remember stories from the accident are still alive (many of the respondents were in their 90s). Many of those who responded were from other countries: Ireland, United States, Canada and New Zealand. As most of the crew came from Liverpool, the response on the crew tended to be better compared to the passengers. The crowdsourcing also harvested other material, such as photographs, certificates, recordings and even objects. Through this type of information gathering, it is possible to gain insight into the later lives of those who survived the accident and even gain knowledge on the fates of the children and grandchildren of those who didn’t. The Maritime Museum is developing a mobile application for people involved with caring those with dementia or other memory-related patients. I sourced for footage and images for the application. I really enjoyed searching for material of the Liverpool’s maritime past and was able to use my skills on copyright issues and knowledge on open content and public domain images available over the Internet. The Liverpool Waterfront exhibition opened at the Maritime Museum in mid-October. I worked with an exhibition officer for selecting audio footage for the exhibition. One of the most impressive footage we found was an interview of the architect who was involved with the Albert Dock’s regeneration project. The archivist Sarah Starkey had conducted an intriguing illustrated interview where the architect explains the regeneration process from its derelict stage up until its opening. I also worked with digital images and their collection management system Mimsy. They also have another system in use, called IMS, which includes solely images. While learning how to use Mimsy it was very interesting to compare the pros and cons of their system and the one in use in my home institution. 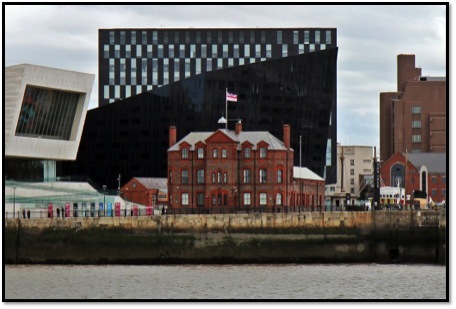 Difficulties associated with cataloguing and the collections management sound familiar: at Liverpool's Maritime Museum they are suffering from the lack of resources with the data input and additional problems with the issues surrounding copyright and lack of knowledge surrounding these issues. With the recent staff cuts, it seems that the staff is too busy to keep the collection up to date. One of the most enjoyable experiences I had was to work with the museum’s ship model collections, which are amazing in quality and size. Working with physical objects is very satisfying and a welcomed change to sitting in front of a screen whole day. Overall, I was happy to be involved with such a variety of everyday jobs and to be given a chance to work with so many different people.